Right, you are handed £500, and can only spend it within 48 hours staying in Edinburgh. What will I do with the money in 2 days? Well this girl here is always up for an adventure, and this would be my dream itinerary for the 2 days, of course anything can happen. My chosen premier inn hotel would be Edinburgh City Centre; it’s the perfect getaway from the hustle and bustle of London. Minutes away from Edinburgh castle, and city shopping centre what more can you ask for. Since I only have 2 days to spend, and I’m big on food I have filtered down to two restaurants. One being a Michelin star, Martin Wishart as foodlist websites quotes. “Martin Wishart’s eponymous venue remains a mecca for Edinburgh’s high earners and food connoisseurs. Dishes are divine and the service second to none.” Just looking at the websites makes me salivate. The £75 6 course-tasting menu is the one for me. As I’m a sushi lover Kanpai sushi would be my other choice. I have been told it is totally amazing and can easily fill my belly with as much sashimi and sushi as I please. I’ve read that Edinburgh comes to life during the months of August, with the fringe festival happening. Anything goes, I would love to watch a JS Bach performance, and some cabaret shows. Once the sun starts setting I would head over to Holyrood Park, and climb to the top of the hills to watch the sunset and admire the stunning views of Edinburgh. Since Edinburgh is built for walking and if I was brave enough to do some after dark tours. The Mercat walking and city of dead tours offers dark spooky walks. Being an earth sign Taurus, I always seem to enjoy being near Mother Nature, there’s something about seeing plants and the bright green grass that makes me relax. The royal botanical gardens are free entry and represents the largest living collection of living plants. Since I’m in north England it is a crime to not to go to the Scotch whisky experience, the 1-hour guided tour goes through a series of displays and exhibitions. 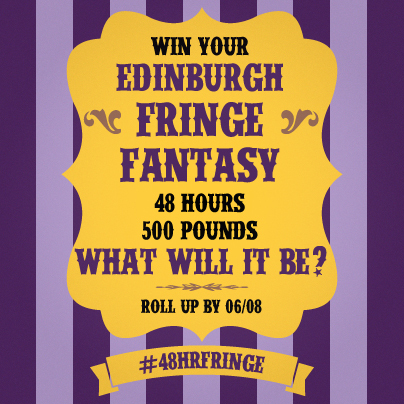 If I win my ideal 48 hours Edinburgh Festival Fringe weekend, I would love to stay at Edinburgh City Centre (Haymarket).